T-15 days until it’s officially fall. That means cozy sweaters, hot tea, and…football season. If you’re anything like us, then you have to add a little sprinkle of glitz into the world of sports jerseys and baseball hats. 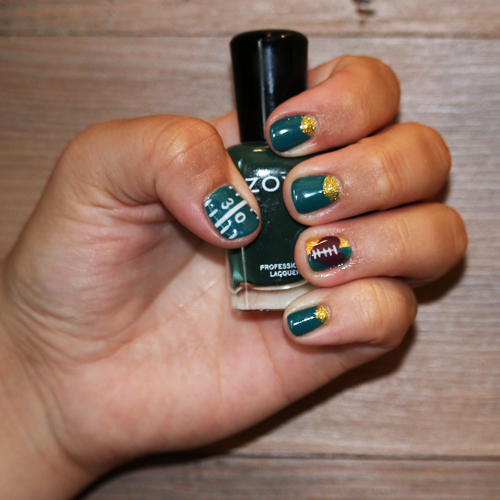 To help us give game day some extra bling, we’ve enlisted Neroli Salon & Spa Nail Designer, Lisa, to show her favorite football nail art. *These design colors can be substituted for your favorite football teams colors. I’m excited to share this design with you, just in time for football season. I’m from Wisconsin and have to show love to the Green Bay Packers, but you can incorporate your any team’s colors into this design. Green & Gold: After painting a base of green on my nails, I take my small point paint brush and make a half moon of gold. Start by making an outline of half circle and then fill it in (had to do about 2-3 layers of gold for it to really pop!). Football Heart: I added this super cute football heart overtop of the green and gold background. I started with a gold base, and then painted the other half green, painting a line of green down the middle and then filling it all in. Next, I took my brown color and made a heart, smack dab in the middle. I start with the outline of the heart, then fill it in. To complete the look, paint a white line down the middle of the heart and then some smaller horizontal lines to mimic the stitches in a football. And ta-da! Now you have some super fun and cute nails to rep your team this season. Field Lines: I love this little 30 yard line design on my nails. I mean, I couldn’t stop staring at the little guy (seriously, too cute to handle). Start by painting a white line right down the middle (note: I had to paint two layers of white for each step). Next, on either side of the line, paint “3” & “0,” or which ever yard line mark you want to showcase. Once those are down, paint your little markers at the top and bottom with just a small little stroke of your brush. Finishing Touches: Once your art has set for about 5 minutes, apply a thin top coat. Make sure to cap the edges of your nails to seal everything in, too! This step helps your polish application to last a lot longer.If you did use the Zoya system, Finish with Zoya’s drying drops to help speed up drying time. Give nail polish about 30 minutes to fully dry, though Zoya sets in about 10 minutes. Facebook: “Lisa Nail Design at Neroli”.